Musicomp is a software developed in the mid-Seventies at Experimental Music Studios of the University of Illinois. It was designed for assisted composition of musical scores. In 1963, Lejaren Hiller and Robert Baker planned a new software designed for the automatic generation (based of particular rules) of musical scores. The Musicomp, as it was named, was programmed in Fortran and Scatre; this last it is the assembler of the IBM 7090. Robert Baker (in front) and Lejaren A. Hiller. The first musical work composed with this software (Musicomp is the acronym of MUsic SImulator-Interpreter for COMpositional Procedures) was Computer Cantata (1963). Following it was adopted for others works, and we mentioned at least Algorithms I (1968) and Algorithms II (1972). In regard to Computer Cantata, this work was a final result, aesthetically pleasing, of a research activity which aimed to testing the efficiency and ease of use of the Musicomp. This help us to understand why Computer Cantata is based on various compositional procedures, also very different among them as much the aesthetic results. Musicomp arose after over ten years of research activity on computer assisted music composition, experimented by Hiller already in the mid-Fifties. With this new project, the idea shared by Hiller and Bakers was to implement a software open to further variations, news or additions. Not only: the concept of a never finished software could satisfy the aim of realizing a technological instrument useful to compose music but not oriented towards a specific music style. Though the Musicomp was programmed for an IBM 7090, was an interesting novelty that the Musicomp was interfaced even with a CSX-1 computer, realized by research labs of the University of the Illinois. This is so important because the computer music pioneer Lejaren Hiller started to try also the sound synthesis and not only the automatic composition. Two sounds were used in Computer Cantata, after developing a particular routine for connecting the CSX-1 with the IBM-7090. 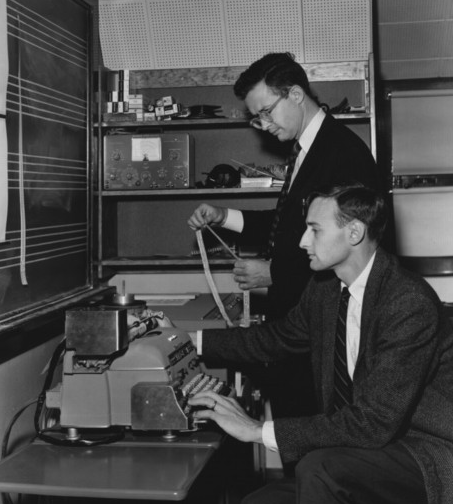 Robert Baker also composed a harmless musical experiment titled CSX-1 study for tape (1963). 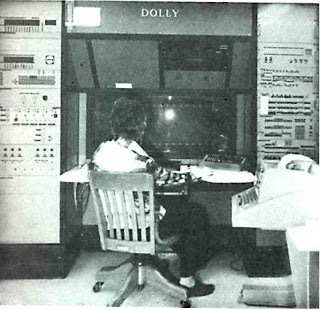 The CSX-1 computer, also called Dolly. In the same years when the Musicomp was completed, Hiller moved to Europe to popularize his research activities conducted in Illinois. So, in 1965 Hiller partecipated at experimental music meetings organized by Hermann Scherchen at Gravesano, Switzerland. Even another computer music pioneer partecipated at the same encounter: Max Mathews, with composer James Tenney. The Lejaren Hiller’s paper was titled Musikalische Anwendungen von Elektronischen Digitalrechnern (Musical Applications of Electronic Digital Computers) which illustrated goals achieved with the Musicomp. Lejaren Hiller, Some Compositional Techniques Involving The Use of Computers in Music by Computers, edited by Heinz Von Foerster, John Wiley & Sons, 1969, New York, pp. 71 – 83. Lejaren Hiller, Robert Baker, Computer Cantata: A Study in Compositional Method, Perspectives of New Music, Vol. 3 , 1964, pp. 62-90.